The Nantan meteorite was discovered in 1958, but probably already fell in 1516. There are writings from that period which suggested that "stars from the sky came who danced like dragons, so light like lightning." During the "great leap forward" iron were eagerly sought for in China, this they needed for the growing industry. In 1958 they discovered the Nantan meteorite and tried to melt it. This fortunately did not work because of the high nickel content, so the meteorite was spared. 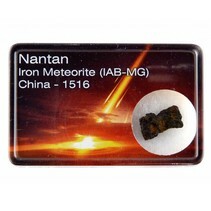 The Nantan meteorite is named after the nearby town of Nantan in China. Because it took many centuries before the Nantan meteorite was recognized as such most of the pieces are rusting. It is therefore advisable to keep the meteorite in an air tight box.